by Dr. Christopher Chang, last modified on 11/12/18. There is often confusion when a patient is referred for speech or voice therapy. The first question most patients have is WHY even bother? The reason is just like an athlete who hurts his knee gets referred for physical therapy, a patient's speech/voice can also get "injured" and require therapy in order to obtain a normal voice/speech as quickly as possible without further damage. Even if surgery is done to correct an underlying injury (whether knee or voice), therapy may be required both before and after in order to obtain the best result. The next question patients have is whether there is a difference between a voice therapist and a speech therapist. Another question, may be what type of therapy is better for a given patient? Can a given therapist provide both speech and/or voice therapy or are there therapists that can only do one kind and not the other? This confusion is quite understandable given people (and even health professionals) often use "voice" and "speech" interchangeably. Rest assured, speech and voice are two completely different words with different meanings and as such are treated differently. Well, before going into what type of therapy is best for a given patient, one must understand the difference between speech and voice. Voice is basically the sound that is produced by the voicebox. Basically, it is the noisemaker upon which the sound produced is modified to ultimately produce speech. In another words, "voice" is created prior to "speech". Voice problems are limited to anatomical or functional abnormalities of the voicebox resulting in a raspy/hoarse/breathy sounding voice. Such problems include vocal cord nodules, vocal cord polyps, spasmodic dysphonia, paralyzed vocal cords, etc. You can see a complete list of voice problems here. Depending on whether a given patient is having a speech or voice issue will determine what type of therapist is most appropriate. To add to the confusion in spite of the clear difference between voice and speech, many voice therapists still call themselves "speech therapists" or "speech-language pathologists" mainly because both speech AND voice therapists initially begin their career predominantly as speech-language pathologists. Just to clarify terminology, the following job descriptors all mean the exact same thing: speech therapist, speech pathologist, speech-language pathologist, speech-language therapist, and SLP. Once expertise in speech-language pathology has been obtained, a select few than go on to specialize in voice therapy. As such, there are MANY more speech therapists than voice therapists. This also means that most speech therapists are not qualified or familiar in treating voice problems. The only way to determine whether a given speech therapist is also a voice therapist is to ask. Another hint that a given therapist specializes in voice is to see whether they are associated with a voice center or a laryngologist. Many voice therapists also are members of Division 3 of ASHA. 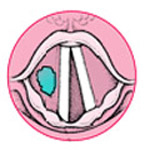 For singers who have injured their voices (ie, vocal cord nodules or muscle tension dysphonia), there is an even more specialized voice therapist who predominantly deals only with singers. Not only are they trained in voice therapy, they are usually very accomplished singers themselves. Such singing voice therapists are usually associated with a laryngologist or a music conservatory. A psychological voice therapist focuses more on environmental and/or psychological factors that contribute to a person's poor vocal quality. Usually, the most common factor is stress in the workplace or in the home. Stress in any form often leads to a type of raspy voice called muscle tension dysphonia due to excessive muscle use during phonation. Such excessive muscle tension may be found only in the voicebox, but telltale signs are often found in the muscles of the neck. The psychological voice therapist aims to help a patient identify and provide coping strategies to deal with daily life stressors leading to an overall more relaxed state of mind and therefore a more relaxed neck leading to a more clear voice. On a related noted, globus is another common manifestation of stress. In our practice, Melissa Mainville, MS, CCC/SLP is a qualified adult speech and voice therapist and works closely with Dr. Chang who is a laryngologist. Colette Reynolds, MA, CCC/SLP is a qualified pediatric speech therapist also familiar with pediatric voice issues. I also work with two singing voice therapists (voice pedagogues) and two psychological voice therapists. What About a "Voice-Lift" with your Facelift?